Discussion in 'The Beat of The Brass: Herb Alpert/Tijuana Brass' started by S.J. Hoover, Jun 23, 2018. I would say, probably(? ), this would qualify as being: the earliest "mega compilation" of what you'd have to call an A&M "greatest hits" release from the vintage era (1969) and, certainly, the most oddball (next to the mono Dee-Jay Sampler). 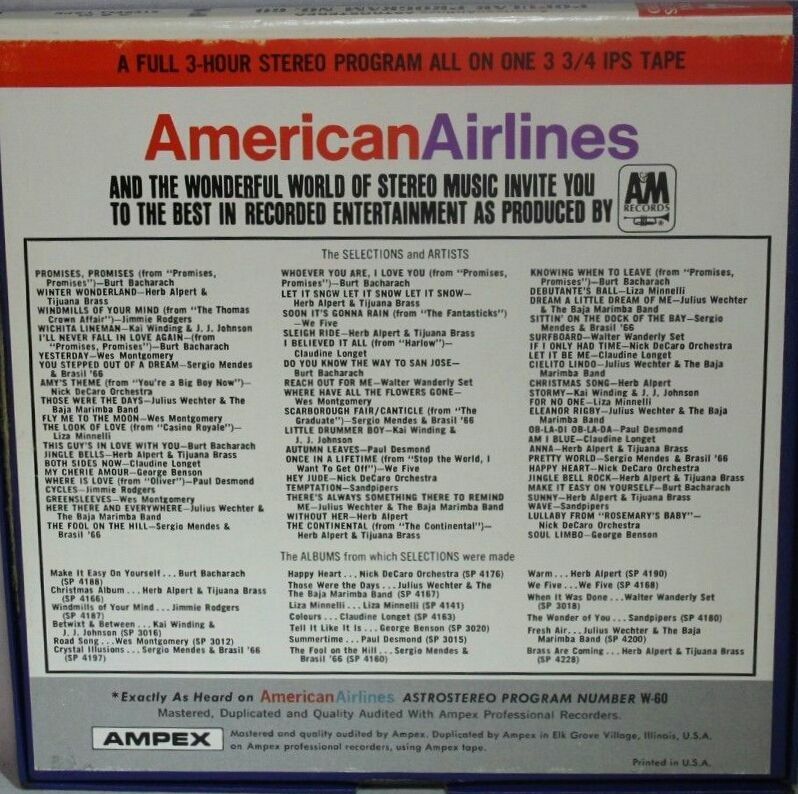 In the '60s: the in-flight musical entertainment aboard airlines was all made commercially available for consumers (sort-of "prerecorded mixtapes") on reel to reel. The program was called "Astrovision Stereo". There were compilations assembled by all the major labels -in all categories...*except* the Rock of the day ; though you'd expect that- which would be given their own, dedicated tape album lasting three hours each. On this, particular one: the selections range all the way from Liza Minnelli's first album to Brass Are Comin'. Unfortunately, for me, there aren't any Phil Ochs or Boyce & Hart cuts included (but, again, I couldn't imagine the "Mad Men" crowd of the times wanting to hear THEM while trapped in a plane! ); however, the obscure Nick DeCaro stuff as well as the Make It Easy On Yourself-Bacharach stuff (which I enjoy) are well represented. As you shall see below, W-60 is actually the fourth in the A&M AA series, however, the first was A&M and two other labels. It seems to me that the selections were the pop hits of the day and some jazz titles as well. Apparently folk (Ochs) and poppy/rock (Boyce & Hart) were not for the intended audience. Also, open reel was for the audiophiles of the day and I'm inclined to think that many of them had jazz leanings. Obviously you can determine the year of the tape by the latest album in the collection. It has taken me years to find them all and I didn't duplicate the above posting. ThaFunkyFakeTation and S.J. Hoover like this. Some time ago, Steve posted the track list of that 64-selection Cruise Along that starts with "In A Little Spanish Town". At that time, I looked through my collection and realized that I had every one of those tracks in one form or another and I decided to make a "jukebox" CD of WMA files for the car with these selections, in order. The first time I played it, I was driving from Orlando area to the Tampa area which is somewhere around an hour, and I was flabbergasted as to just how well-programmed this tape, now my CD-r, was. Bacharach songs flowed into Bacharach songs, Brazilian stuff into other Brazilian stuff, soundtrack selections into soundtrack selections, Beatles songs into Beatles songs. I recommend at least that program highly. Knowing how well that turned out, I shall be digging into these other ones too. Thanks guys for posting the artwork and track lists. I'd known the earliest one (in conjunction with the Time and Mainstream labels) existed; but I thank you for showing the '67 and '68 tapes I hadn't seen before. As an aside, one of the few "Top 40"-oriented Astro reels they did make was: a Motown compilation in 1968 (I would like to find). I wonder, though, how by the 1969 edition of the A&M one: Ampex was still able to license copies when, by that time, A&M had moved onto "MTD" (Magtec) to handle their reel duplication(?). Apples and oranges. 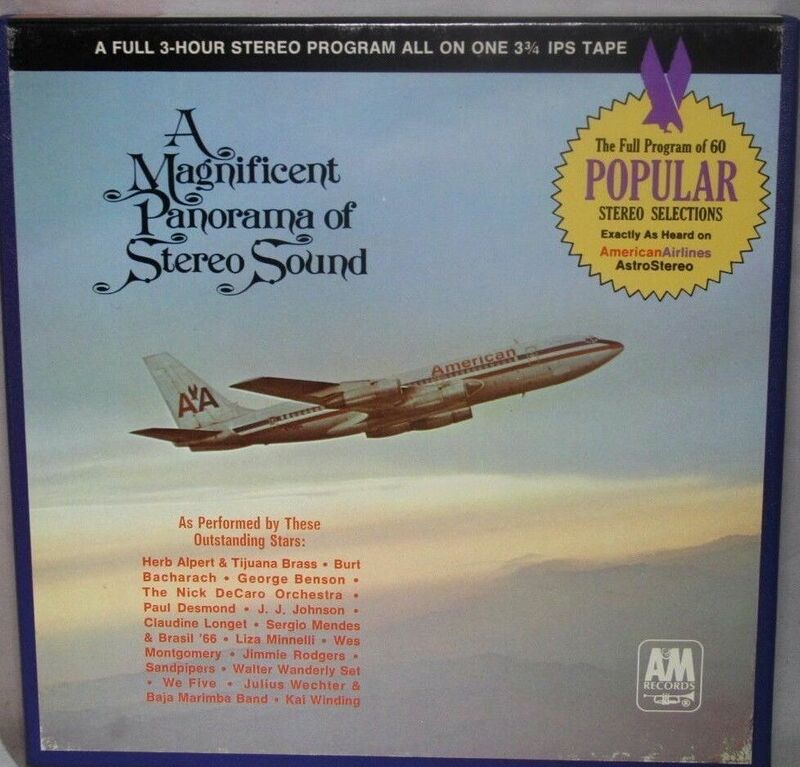 A&M licensed to American Airlines for in-flight entertainment and Ampex happened to be their tape supplier/duplicator. I'm not sure how or where these compilation tapes were sold, as I did not collect open reel tapes back in the day. Regular A&M album releases would stand by themselves. There were several changes over the years, with 4-track, 8-track, open reel and cassette. The Ampex yellow label/clear-reel releases of the A&M catalog were inconsistent in their quality and are not preferable to the black -or grey- reels A&M themselves sold from 1968-1972 (before it all became exclusively Columbia House awful-sounding junk: duped over 120ips and from the same master intended for the cassette release). It was uncharacteristic, though, of Ampex to re-issue tapes from labels where the contract with the record company was no longer in effect (the longest one they had was handling London Records' tape product; between 1962-1975). However, most of the "Pop" catalog Ampex had once issued on r2r (initially) --- went to General Recorded Tape if it was re-released after 1971 and it was all re-done at 3 3/4ips (the only 7 1/2ips tape GRT ever made was: Around the World with Three Dog Night; in 1973). Another case, too, was that: Ampex happened to issue a really poor, 3 3/4ips, 1966 copy of the fake stereo Beatles A Hard Day's Night soundtrack. When United Artists Records changed tape duplicators in 1969 and went to Bell & Howell: the reissue was actually *better*(!). The latter version of A Hard Day's Night -on r2r- is at 7 1/2ips and all the vocal tracks are just left in their mono mixes (with the incidental music in stereo). Coincidentally, when Capitol changed tape suppliers around the same time by actually going to Ampex: Ampex reissued the Beatles catalog on r2r dramatically improved (one album per tape and at 7 1/2) over how Capitol had manufactured the reels from '64-'68...but: Ampex did not reissue the album SOMETHING NEW because, it contained "Unart-published" songs (from A.H.D.N.) which Ampex no longer had a contract to license. That's what makes the point about the (last A&M) American Airlines tape so odd. Facts, the American Airlines/Ampex Astro Stereo tapes were decent on better machines. A client/customer of mine (ex American Airlines pilot had 20 of these tapes). I transferred these on my slow speed Otari reproducer. These tapes sounded better than most 3 3/4 IPS tapes did. Amazing when in nice condition. These tapes the ex pilot for AA gave me to work with were very low noise, stable and low wow/flutter, and no dropouts (his copies had no cupping of tape or sloppy wind issues). I like them enough to buy a few for myself. LPJim and Rudy, know my ear, and the equipment I own, and my standards for sound quality.